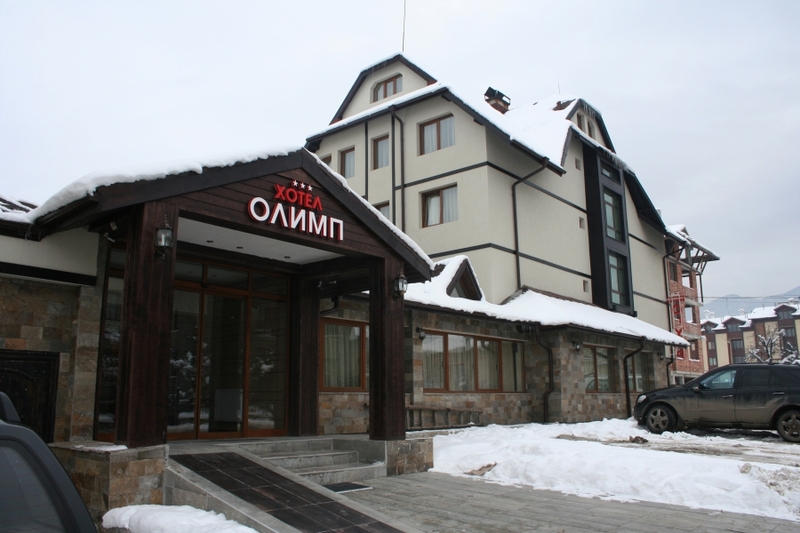 Located at the beginning of Bansko, Hotel Olymp may be your first encounter with the hospitality of the beautiful mountain town. With the kind attitude, good service, clean and comfortable rooms, the hotel offers ъоу the opportunity to spend a pleasant and memorable days. Olymp Hotel consists of two buildings connected by a reception and lobby bar. Has 30 double rooms, 4 suites and 2 maisonettes. The guests can use 24-hour reception, safe, kids playground, internet access, free parking, relax center, sports hall, ski storage for own gear and transport to the ski lift. In the garden there is a small outdoor pool, a lovely barbecue place where you can really escape from everyday life. For its business guests the hotel offers a conference room with 40 seats capacity. There you can use Internet access, printer, projector, screen, flipchart, sound system. The hotel has a classic restaurant, a traditional bansko style tavern for groups and organized events, garden with barbecue and a lobby bar with a variety of proposals and excellent service. In the Relax area of the hotel you will find a real place to rest and reach a balance between body and soul. The Relax center offers a steam bath, Jacuzzi, sauna, massage room and a small cold pool with cold water. Most - serious advantage of Hotel Olymp over all other hotels in the city is the presence of sports training hall, designed to be multifunctional. In addition to the preparation and training of power sports such as wrestling, taekwondo, kick boxing, MMA, aikido, karate, you can use area of more than 300 square meters in a comfortable atmosphere and pleasant music. You can enjoy your favorite sport or folk dance, gymnastics, aerobics, tae-bo, pilates, yoga and table tennis.